You know the difference the moment you bite into the ear: crisp, farm-fresh sweet corn that hits your taste buds with a wave of flavor. You just can’t get that same sensation from produce that’s been picked, boxed and transported to sit for days in displays at large commercial stores. 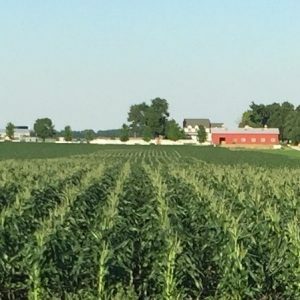 The Keller family has been growing fresh sweet corn in the region since before Abraham Lincoln was president – that’s five generations of farmers, and the sixth is quickly learning! 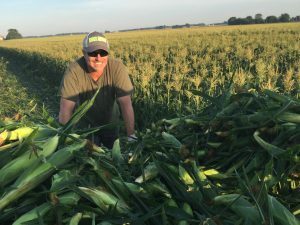 Each year, we harvest more than 35 acres of sweet corn right here on our farm so it’s ready for your enjoyment from mid-July through October. What Makes Great Sweet Corn? The key to our one-of-a-kind sweet corn is the love and care we put into growing it. We start by planting it in our fertile Oswego farm soil when we determine the conditions are just right in April. We then continue planting it throughout the season so we have plenty to offer. Think of us as a farmers market that keeps busy most of the year! 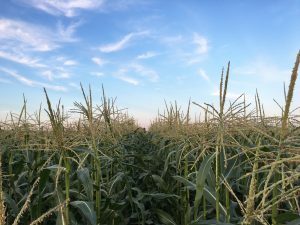 Other factors for premium sweet corn are frequent spring rain and the warmer summer temperatures. Moist soil plays the biggest part, sometimes helping our fresh corn grow inches in a day. We also use high-tech scarecrows and sound systems to keep the birds away from our crops – we don’t want anything to compromise the quality of your sweet corn. When it’s time to harvest, we taste it to decide which varieties are ready. We choose only the ears that are at their peak sweetness, usually after about three months of growth. 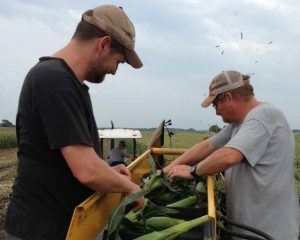 We pick the best fresh corn each day – sometimes up to three times per day. We then deliver it to our farmstands, as well as to our mall market in summer. Keller’s Farmstand is all about celebrating (and eating!) the finest produce the land has to offer. Make your plans to visit soon for premium sweet corn! 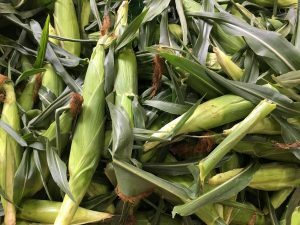 While you’re at our market or one of our farmstands, husk the sweet corn so you can choose the perfect ears to take home. If you can’t eat the corn on the same day, be sure to refrigerate it. You’ll have 3-4 days of ideal freshness. After then, the natural sugars will slowly turn into starch, making the corn less sweet. Boil sweet corn for 3-4 minutes. Remove corn from water, drain, and serve! Soak in water for 30 minutes. Grill for 15 minutes. Turn once or twice. Carefully remove husk and serve! Carefully peel off husk and enjoy! Typically, only one ear of corn grows on a stalk; if there is a second, it is much smaller and undeveloped. 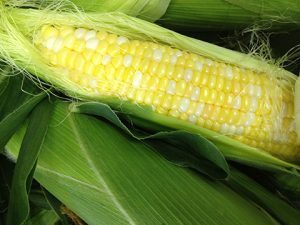 An average ear of sweet corn has 800 kernels depending on the variety. Typically, an ear will have 16–20 rows of kernels (always an even number) and yield approximately 3/4 cup of corn. Connect with us on Facebook, Twitter and Instagram to keep current with food, news and events at the farm. Get our special corn recipes on Pinterest too!